Nanchuan is less than an hour from Chongqing via a new and barely used motorway being pushed through to Wulong and eventually Qianjiang to the south east of the Municipality. Jinfo Shan 金 佛 山 is arguably the main attraction in the county, another of those cool summer mountain retreats but is best known as a white winter wonderland. A recently constructed skyway takes visitors on a breathtaking 'over the edge' journey on one of the areas spectacular clifftops. 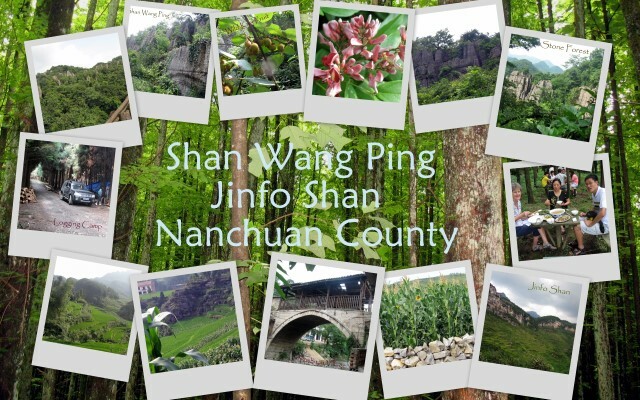 Another less famous escape for a day trip or weekend is Shan Wang Ping 山 王 平which lies within the Jinfo Shan Nature Reserve. This self drive, preferably 4X4 destination is a great off-road experience through small villages and terraced farmlands of rice and corn in steep narrow valleys over narrow winding gravel roads. Attractions include an overgrown Stone Forest with stunning views of the surrounding valleys, and a Gingko nursery. A regrowth forest of cypress and fir trees provides seasonal work and extra income for local farmers in the logging camps throughout the mountains. Once inside the Jinfo Shan Reserve, veer left and follow the river as it climbs to the mountain pass. Shan Wang Ping is about ten kilometres down a poorly marked gravel road to the left before arriving at the pass into the next valley. The return trip is a far more interesting and fun drive, especially in a four wheel drive and begins from the Gingko Nursery and gardens. Take a break at the nursery and drink from the spring before heading down the valley. Look out for the 100 year old covered bridge on the left as you enter Yuchuan Village. It’s another hour back to Nanchuan and the motorway from here.